Adapted from my Grandma’s recipe. This is more of a buttery sugar cookie as compared to a regular sugar cookie. You will need two cookie cutters of the same shape for this one, one big and one small for the window effect. Makes about 24-28 cookies depending on the size of the cookie cutter. 1 Line two rimless baking sheets with parchment paper. 2 In large bowl, using an electric mixer, beat butter with sugar until fluffy; beat in eggs one at a time. Add vanilla extract and beat in. 3 In separate bowl, whisk flour with baking powder; gently stir into butter/sugar mixture. 4 Chill in the fridge for at least an hour, this will make it easier to roll out. 6 On lightly floured surface, roll out dough to 1/8-inch (3 mm) thickness. The dough is very soft, so you might have to flour the board a little thicker than usual. Make sure your rolling pin is well floured as well. 7 Using the larger festive cookie cutter, cut out cookies. If it sticks to the dough, lightly flour. Place the cut out cookies about 1 inch (2.5 cm) apart on prepared baking sheet. Important note: For half the cookies use the smaller cookie cutter to cut out a window. It’s important to do this right on the baking sheet and not on the board, transferring the cut out from the board to the sheet can misshapen the cookie and then they won’t fit together when you are assembling them in step 10. Repeat until all of the dough has been used. 9 Make the icing: In small bowl, stir together the icing sugar, almond extract and enough hot water to make thin icing; spread over tops of the cookies that have the window. Let dry completely, about an hour. 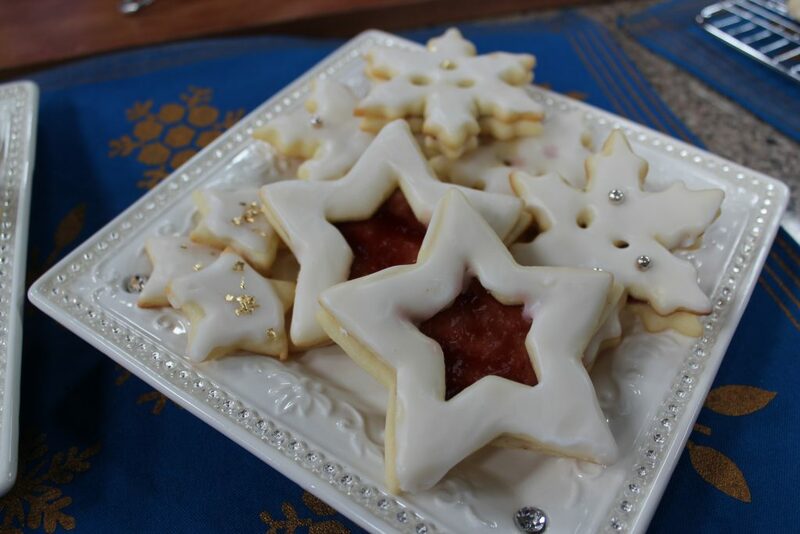 10 Lightly spread bottoms of half of the cookies with jam; top with iced cookies. Let set for an hour. Carefully store in an airtight container in between layers of parchment or waxed paper. No nutrient breakdown….it’s a treat so just eat one…….